This simple tomato-based glaze is perfect with ham or bacon. You can turn up the heat by adding more chilli, but always start with less chilli - you can add more but you can't take it away! First weigh your ham fillet to calculate the cooking time - it will need 20 minutes per 450g. Line a roasting tray with tin foil. Place the ham, onion, carrot, chilli and smoked paprika in a large pan and cover with cold water. Bring to the boil, then reduce to a gentle simmer and cook for 20 minutes per 450g, until the meat is cooked through. A 1.6kg ham fillet will take 1 hour 10 minutes to cook. Remove the ham from the saucepan and place in the lined roasting tray. Meanwhile, to make the glaze, place the tomato passata, chilli, brown sugar, cider vinegar, smoked paprika and mustard in a small saucepan and bring to a simmer. Allow to reduce by one-third, then set aside. To make the spinach mash, place the potatoes in a large saucepan and cover with cold salted water. Bring to the boil, then reduce the heat and simmer for 15 to 20 minutes, until completely tender. Drain in a colander and return to the saucepan. Add the butter and buttermilk and mash until smooth with a potato masher. Add the spinach and season well with salt and pepper. 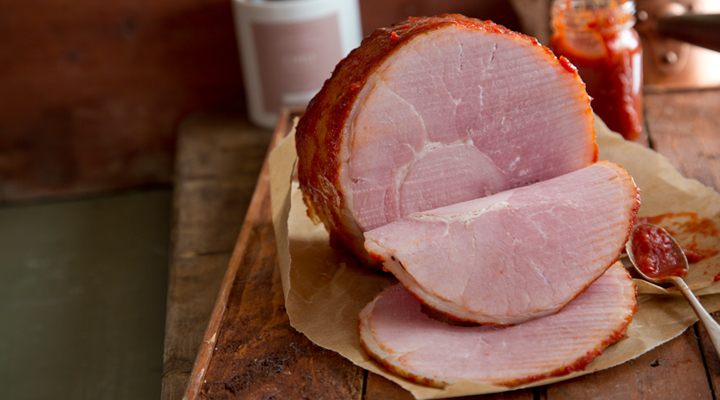 Spread the tomato glaze over the ham with a spoon, then cook in the oven for 20 to 25 minutes, until golden brown. Remove from the oven and rest for 5 to 10 minutes, covered in a foil tent, before carving. Serve with the spinach mash and extra drizzle of the tomato glaze.